* Available the CE-certified "E" model only. Alinco proudly led the way in breakthrough miniature electronics technology with its revolutionary "credit-card" size transceivers and receivers. The DJ-C6 is the youngest in the family made available for those who demand a simple communication tool for daily-use that fits right in a shirt pocket. Plenty of memories for your favorite frequencies. Save your choices in any combination of VHF and UHF. Each memory channel can retain frequency, frequency shift and offset, mode, tone encoder and decoder settings. Powerful Lithium-ion battery provides 600 mAh for long service between charges, yet it takes only about 2 hours to recharge it. Transmits with up to 500mW (External 6VDC supply) of power. You..ll be amazed at the range you can cover! Just set the frequency range, shift and tone the local system requires once, then let the C6 work for you to access the repeaters stress-free, at home or whatever you travel ! The DJ-C6 is small but powerful in its abilities. Choose the operating profile that suits your needs and quickly change from one mode to another. 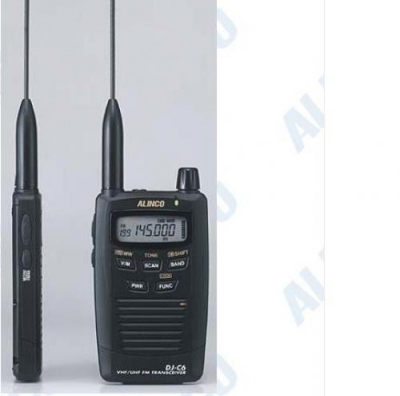 Share programming with multiple DJ-C6 transceivers from a master unit or use a PC to program (requires free downloadable software available from www.alinco.com and optional interface cable). * Please be advised that DJ-C6E does not include an antenna-cap that you may see in the standard accessory list on the instruction manual.